Born and raised in Philadelphia, Jerry Ricks is currently living and performing in the Delta. Jerry Ricks has lived everywhere. He has played with such revered Bluesmen as Son House, Brownie McGhee, Mance Lipscomb, Sleepy John Estes, Skip James, Furry Lewis, Bukka White, and many others. During the blues revival of the 60s Jerry was booking traditional Delta Blues men into the coffeehouse where he washed dishes in Philadelphia. They taught him about the Blues and became life long influences in both his music career and his personal life. He spent much of the 70's and 80's hopping back and forth across the Atlantic. As with many bluesmen during this period, Jerry found new audiences in Europe when the Blues jobs seemed to be on hiatus in the states. In the early 90's he decided to come home. Not just home but home to the Delta. Not his home of youth but the home of his music and the many many bluesmen who had been his friends and mentors along the years. 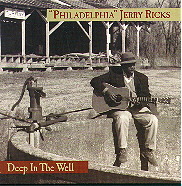 "Deep In The Well" is "Philadelphia" Jerry Ricks latest CD on Rooster Blues. Recorded at Stackhouse in Clarksdale, Mississippi, Ricks sings mostly original compositions with some traditional Blues.